Standard size and colors available to order online OR complete the Custom Order Form for more options. ​See below for detailed product information. Please note that all Aerial Animal rope products are custom made to your specifications and may require fabrication turn-around times of up to 4 weeks. If you require expedited service, please contact us. Quicklink (Standard) Carabiner +$15 ea. Rope is reinforced with 3/16 inch Amsteel which has a minimum breaking strength of 4900 lbs. 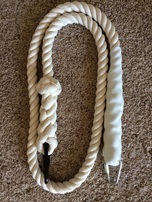 Standard price of $150 includes 5 feet of 3/4 inch diameter 3-strand high-quality, white 100% cotton rope on each side. Top eye splice incorporates a stainless steel thimble and is finished with a nautical style whipping. Perfect for hanging double-point lyra from a central point. Lower splice is finished with our signature Wall and Crown knot. Maillon Rapide steel 40 Kn quicklink lower connector. 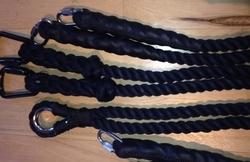 SPECIAL - NO UPGRADE CHARGES ON BLACK LYRA ROPES OR BRIDLES! Top eye splice incorporates a stainless steel thimble and is finished with a nautical-style whipping. Perfect for hanging double-point lyra from a central point. Splice on 24mm rope is significantly larger than 22 mm splice. Gauntlets provide a classy and smooth rope for aerialists who work in the rope. Standard price $120 includes 5 feet of 22mm diameter 4-strand high-quality, white 100% cotton rope. One Fusion 50 kN steel carabiner. We use integrated quicklinks and carabiners to reduce the number of pieces of equipment needed to rig your apparatus. Splices are expertly finished with our signature Wall and Crown knot. Ideal for use with a single-point lyra with or without a swivel. ​​Use of Aerial Animals LLC’s products is at the Buyer’s risk. By purchasing this product you are assuming all responsibility for your own safety. Buyer understands and agrees that the use of the equipment purchased from Aerial Animals LLC may be dangerous to human safety, may result in injury or death, and present a risk of damage to property, if not used properly. Buyer must routinely inspect equipment for any wear or tear which can occur after repeated use. Use of Aerial Animals’ equipment that is compromised in any way from its original condition must be discontinued immediately. Aerial Animals LLC is not responsible for any mishaps, injuries or damages resulting from the Buyer’s use of the product. Our products are rigorously tested and are safe for aerial training, instruction, and performance. But like any tool, our products are only reliable if used properly. Never forget the dangers of suspending yourself from any height without a safety system in place. Consult a professional rigger to hang your apparatus.